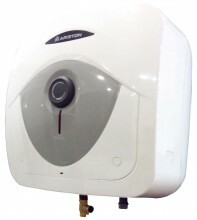 Our range of portable, compact size but high performance water heater sets specially designed to give you maximum comfort in your bathroom and provide you with warm and hot water any time. The water heaters comes in various sizes, exquisite designs and colour combinations with new advanced titanium enamelled tank technology for greater protection; comes with total ABS package of anti-overheating, anti-freezing, anti legionella and dry heating auto diagnosis. Energy saving and it's easy to clean, Anti-Bacterial rate up to 99.9%. Premium design with black or grey frontal panel, multi-functional large LCD display, copper heating element, temperature regulation, high hydraulic pressure protection and earthing protection. Click the button below to add the Ariston 15 Liters Electric Storage Water Heater to your wish list.